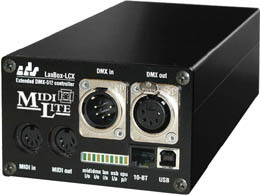 The LanBox-LCX is the "big brother" of the LanBox family of DMX controllers. The LCX has built-in Ethernet, USB, MIDI In/Out, DMX In/Out and all of it's ports can be used simultaneously! The LanBox-LCX can be used with additional LCX or LCE controllers for up to 3072 DMX channels, distributed over 6 universes. Bundled software includes LCedit+ a graphical lighting editor for MacOS, Mac OS X and Windows 98SE/2000/XP. Includes power adapter, USB and Ethernet cables, and FREE software updates and upgrades! We ship only to to the USA & Canada - Order Here!. maximum of 3,072 active light channels. 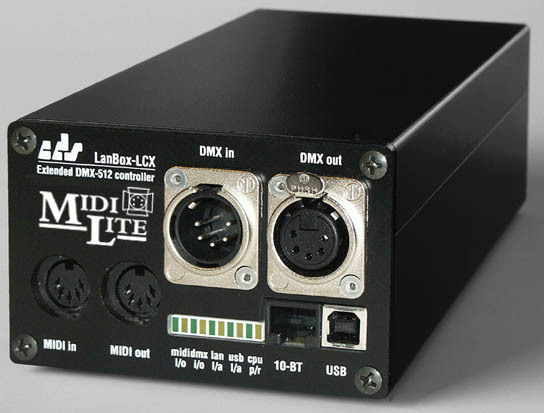 DMX-512 USITT 1990 protocol, 3 selectable speeds. DMX Input, can be merged into DMX output and used as input for scenes. Thousands of cues, divided into maximum of 999 cue lists with 99 cue steps. (The actual maximum number of cues depends on number of channels used in a cue). Distributed DMX over UDP, for up to 6 universes (3072 channels) with one LCX and 5 LCEs. LanBox-LCX is an AppleTalk over Ethernet compatible device. LanBox-LCX supports TCP/IP with static IPs. Multiple LanBox-LCs are supported automatically. Editing, monitoring and executing can be done from different Macs/PCs. 5-pin XLR female DMX output connector and 5 pin LXR male for DMX input. RJ45 (10BT) connector for the network. 5 pub DIN connectors for MIDI In/Out. USB type B connector for USB. 37 pin D-sub connector for external I/O. AppleTalk (ADSP), TCP/IP for editing and external triggers via Ethernet. USB serial, for editing and external triggers. MIDI, for editing and external triggers. Note On/Off translation to DMX values. Program change translation to select scene (cue list) command, and Go Next/Prev. SysEx implementation for full lighting editing. MIDI Show Control level 2 support. Full editing and execution control. 8 analog inputs, 0-5V, high input impedance, 10 bit resolution. 8 digital outputs, max output current 20mA, short protected. 37 pin D-sub connector includes +6V and 0V connection per I/O channel. 20 I/O conversions/updates per second for all channels with standard firmware. Height: 65 mm (2.6 in). Width: 104 mm (4.1 in). Depth: 166 mm (6.5 in). Weight: 840 g (29.6 oz). 512kB FlashPROM enables easy upgrading of firmware. Copyright 1995...2006 LanBox is a registered trademark of CDS advanced technology bv. All other names referenced are the service marks, trademarks or registered trademarks of their respective companies.